A winning compilation from the hyper-prolific, esoterica-influenced experimental-psych outfit. 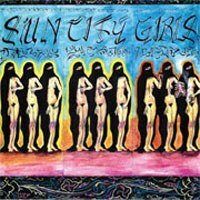 Compilation releases were made for bands like Sun City Girls. The now-defunct trio has released 50 albums in its 26-year career, and that’s on top of 20 cassettes, videos and 7-inches. The third in a series, Eye Mohini focuses on Sun City Girls’ output from the late 1980s and ‘90s, a time when more Eastern influences were making their way into SCG’s strange experimental/psych mix. Although volume three works best when partnered with the previous two volumes, the release still stands as a good and intriguing primer on a hugely underrated band. Highlights include the Asian folk-inspired “Kickin’ the Dragon” and all four songs from the Eye Mohini 7-inch, a strong 1992 release featuring the eclectic "Kal El Lazi Kad Ham".